One memory of InStallation is a chain of enduring images, seen through washes of blue and white light. A Chinese pole swings as a pendulum, casting a crisp shadow. Sawdust dropped onto a spinning diablo is flung outward in a shower. Thin strings of rope cascade and turn around a woman outfitted for rain. A stallion with bell-covered anklets trots around the ring, turns a circle, is joined by another, a third, a fourth—four white horses then, almost glowing, and a rhythmic sound of bells. An old grand piano is carried in, and stays in. The industry of setting a tightwire is half-seen, lit by a luminescent spinning diablo, carried everywhere balanced on a finger, thrown even to an aerialist wrapped above in black silks. A high, gentle melody plays on the piano. These are brilliant scenes, but setting InStallation apart from productions that become over-involved in their own beauty is a remarkable confidence in its transitional moments, kept perhaps from its origin as a performance made for friends, and an underlying structural sophistication. There are acts, certainly—at times quite unusual ones: swinging Chinese pole isn't so common, and a rope drawn into strands allows a neat doubles routine crossing freely between straps, silks and corde lisse vocabulary (just one indicator of the cast's multidisciplinary talents)—but no neutral moments, nothing that you would call a set change or a rigging interlude. The production is delicate and complete—an echoing, unfolding, musical work where each scene contains the idea or materials of the next, and keeps what remains of the last. 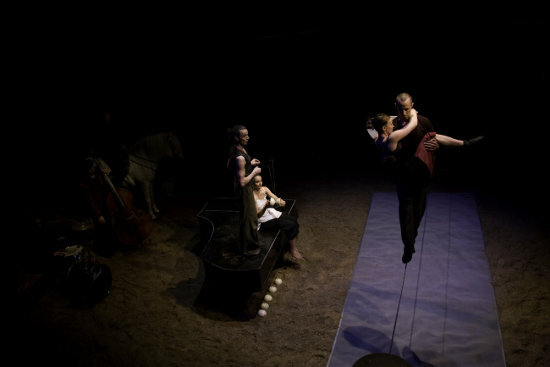 Human performers running the circumference of the ring become cantering stallions; a white horse becomes a black one; a man dashes in and out with half a bicycle across his back which will later return and play its part. Most striking, the image of the wire is taken and reflected in miniature by a spinning-top diablo, like a lady in white, that walks the line of a tight-drawn string. Character doesn't feel like an operable concept here; nor does narrative. Autobiography is way out, too. The detail instead is in the interplay between the performers' various physical presences: Petronella von Zerboni's cool remove offsets the upright and wily Roman Müller, the duo's immaculately performed and reckless diablo routines moving across both circus ring and the top of the grand piano; Ulla Tikka's fluidity and grace is matched against the straighter muscularity of Andreas Muntwyler, an interesting aesthetic opposition that is most provocative on tightwire, where Tikka's cleanliness and beautiful form is counterpointed by Muntwyler's unorthodox, but basically still successful, technique (essentially: flail and stay on); horse whisperer, trainer and rider Niklaus Muntwyler is dark and sensitive as a medium, riding out on a black stallion like a circling premonition; then musician Lukas Staeger, at the piano and in the ring, has an enjoyable and slightly dissonant not-a-performer deadpan, almost like a controlled and superior version of the traditional audience participant. What it all adds up to is a piece that hovers in the space between abstraction and literalness, where we're somewhere out of the ordinary but also at home, just as happy to spend a minute watching a man dig a trench in the sawdust to lay a wire as to watch another perform a back somersault on a perilously thin cable. It's strange and captivating; a piece that holds your attention but holds it gently, passed like the lantern diablo that visits every part of the ring.